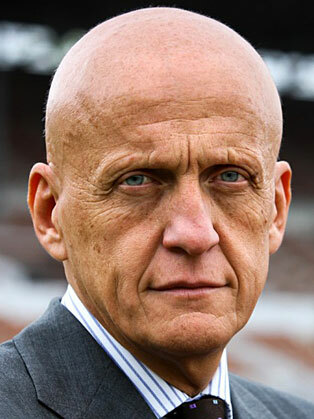 Pierluigi Collina grew up in Bologne and graduated with a degree in economics from the University of Bologne in 1984. During his teenage years, he played as a central defender for a local team, but was persuaded in 1977 to take a referee's course, where it was discovered that he had a particular aptitude for the job. Given his natural ability as a referee it didn't take him long to climb through the ranks, and within 3 years he was officiating in top-flight football. All achieved whilst completing his compulsory military service. After taking charge of 43 Series A matches he was placed on FIFA's Referees List--this being the pinnacle of any football referee's career. He was allocated five matches at the 1996 Olympic Games, including the final between Nigeria and Argentina. Then, within the space of 3 years, Pierluigi was placed in charge of the world's 2 biggest football matches; the 1999 UEFA Champions League Final between Bayern Munich and Manchester United, and the 2002 World Cup final between Brazil and Germany. In his book Le mie regole del gioco ("my rules", not "the rules"), Pierluigi writes about his preparations before a match, which perhaps give some insight into why he was such a top referee. He was a stickler for detail and always tried to find out as much as possible about the teams, the players, the style of play, and the history between the teams. He knew beforehand what a coach would do when his team was a goal behind, and he even wanted to know whether the players were left or right footed! Pierluigi is famous the world over, particularly in Japan after appearing in a TV commercial for frozen takoyaki products. He also officiated the Second Round match between Japan and Turkey at the 2002 FIFA World Cup. He retired in 2005 after refereeing his last major international tournament, Euro 2004. Achieving Best Referee of the World for 6 years in a row (1998-2003), his love for football continued after his retirement and he acts as a non-paid consultant to the Italian Football Referees Association (AIA), and is a member of the UEFA Referees Committee and UEFA Chief Refereeing Officer since 2010. He has also been the head of referees for the Football Federation of Ukraine since 2010. FIFA Chairman of the Referee Committee since January 2017 and UEFA Chairman of the Referee Committee since June 2017.